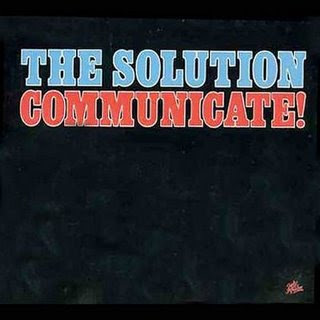 Good Music You Haven't Heard: The Solution- Communicate! "Communicate! ", the album from Euro-American soul band The Solution may just be the best release of 2004. A magical blend of soul, R & B and the slightest hint of Motor City rock and roll (via Sweden), it also marks another coming together of two prodigious talents in Hellacopters leader Nicke Royale and Michigan veteran Scott Morgan, neither of whom should need an introduction. The pair first worked together in Nicke's Hellacopters, the Swedish band that he fronts as singer and guitarist. A dynamite single comprising two longtime Morgan staples, "Slow Down, Look Around" and "Sixteen With a Bullet", on SubPop was inspired and flowed from Scott's guest spots with the Swedes on a US tour. 'Copters fans will recognise the Royale/Morgan-penned "Hurtin' Time" on the gold record-earning "Hi-Visbility" album that followed, and the pair also worked together in the first Hydromatics line-up. A Europe-based project that celebrated the music of Sonic's Rendezvous Band, the hi-octane but well-hidden Detroit band that numbered Scott as a founding member, the Hydromatics found Nicke on drums, a role. The first Hydromatics album, "Parts Unknown", is a hard-to-find gem and the only one of two so far released that features Nicke, who had to return to the Hellacopters. Although Nicke is back behind the traps, The Solution is altogether a different prospect to previous collaborations, taking a sharp detour into soul music. Morgan's considerable pipes were a big part of his '60s teen prodigy Michigan band The Rationals, a bunch of soulful beat music fans who took on board psych and more rocking influences as they entered the '70s. Morgan fronts The Solution on vocals and occasional guitar, with a Nicke-assembled big band line-up (including a horn section and female back-up vocalists) that's unlike anything most fans of their contemporary work have seen. This band is very a sum of its parts, however, with superb ensemble playing, all-round.e seen. This band is very a sum of its parts, however, with superb ensemble playing, all-round.